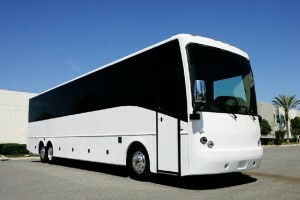 For Tampa Party Bus service and Tampa Charter Bus Rentals we are the go to resource! Our incredible fleet of luxury party rentals includes a party bus for 50! Our Luxury stretech limos, hummer limos, and party buses in Tampa can cater to groups with 10 passengers or 50 passengers. 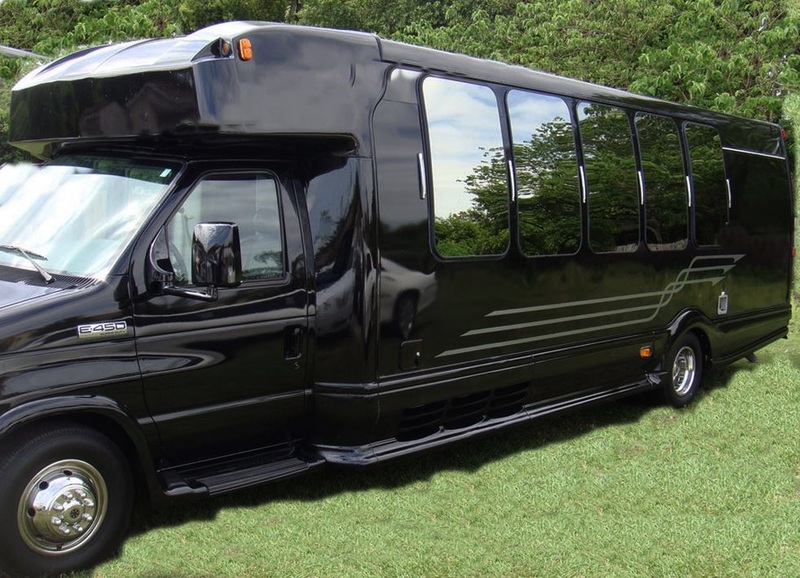 Tampa party bus rentals in Southwest Florida are an excellent choice for prom, homecoming, transporting wedding guests from hotel to reception, and for bachelor and bachelorette parties! 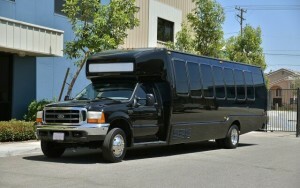 We can also take you to a concert or sporting event of your choice. 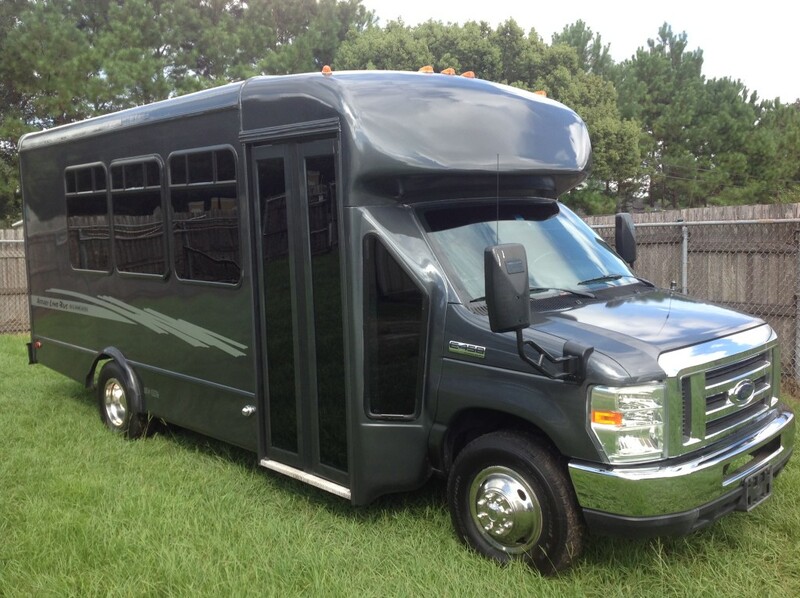 Our party bus service is superior in the Tampa area and surrounding cities. Take a ride to the next Tampa Bay Devil Rays or Tampa Bay Buccaneers game in a luxury coach or do a Christmas light tour of your favorite neighborhood and enjoy cocktails along the way. Our buses come with free soda and ice. Limo buses in Tampa are also equipped with a TV, CD/DVD/MP3 player and more! Most of the Tampa bus charters have fiber optic lighting that changes occasionally and surround sound to boot. Please no food or illegal substances allowed on the bus or in a limo whatsoever. Tampa Limousine VIP offers Party Buses in Tampa Florida for all events. Bachelor Party rentals, Birth Day Party, Football Games, Weddings, Prom, Homecomings and more. See our fleet of amazing party buses and call, email or chat with us now to get the best rates, and check for availability. Here are just a small sample set of party buses we have servicing the area. 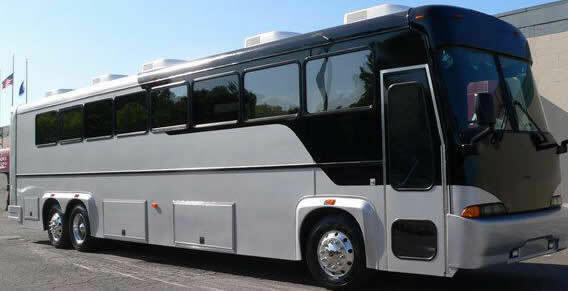 This mega Tampa party bus will exceed your wildest imagination. A brand-new conversion of the largest Tandem-Axle 45 ft Entertainment Coach Chassis – a beautiful party bus addition to our fleet! 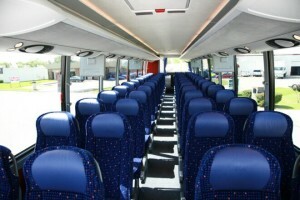 Corporate Bus Rentals for hire with traditional interiors. The Ultimate party on wheels. The fun doesn’t stop until you tell it too! 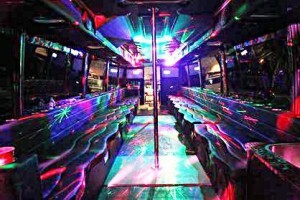 This mega party bus in Tampa is a real crowd pleaser and a favorite for Bachelor/Bachelorette parties. 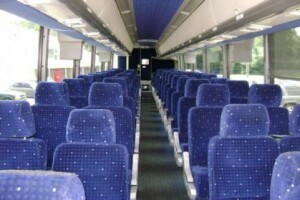 Entertainment Coach 40 Passenger Charter Bus Service in Tampa Florida. This stunning Tampa party bus will exceed your wildest imagination. A brand-new conversion of a 40 ft Entertainment Coach Bus Chassis that seats 40 passengers. 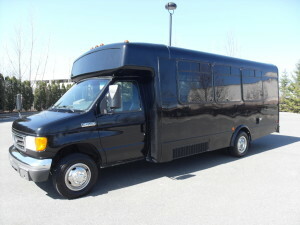 This is the top rate bus for large parties and corporate transportation. 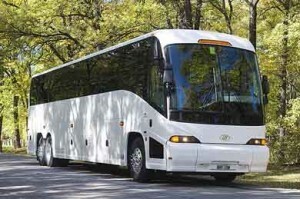 Standard charter buses available for school trips. We also have corporate 40 passenger buses for hire with traditional interiors. 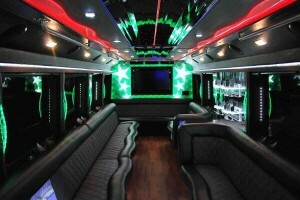 This is our most popular party bus and it will exceed your wildest imagination. 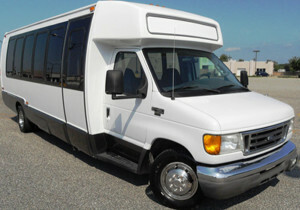 20 Passenger Party Bus Tampa Florida. 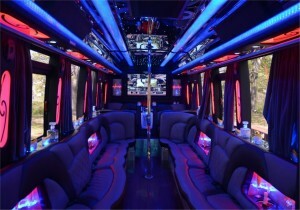 This party bus is sure to please everyone – a real crowd pleaser. 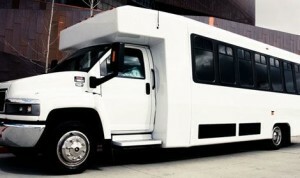 This Tampa party bus fits up to 18 passengers. Remember to reserve your Tampa party bus through Tamp Limousines VIP before arriving at the Tampa International airport. 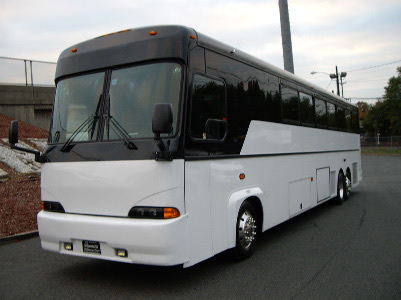 We will make sure that you get the best cheap party bus in Tampa Florida to pick you up at the airport. 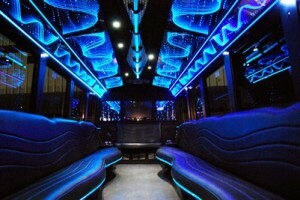 You can get the best party bus Tampa rates via mobile or lap top through Price 4 Limo. If you need assistance making a reservation, our experienced customer care experts will guide you through the steps. Tampa Limo VIp will get you the best party bus Tampa rates, so you can focus on having a great time with your family and friends here in Tampa Florida. *We work with the hottest clubs in the Tampa Bay Florida area and may have free admission passes and/or free drink passes. Call us at 1-813-229-1910 for details and a free quote. The Castle – this is an ideal venue for anyone wanting to have a memorable night out! Tampa Bay Water Bike Company – spice up your trip with some outdoor fun! Seminole Hard Rock Casino Tampa – a great spot for gambling! Fox Jazz Cafe – have a few drinks listening to quality jazz. 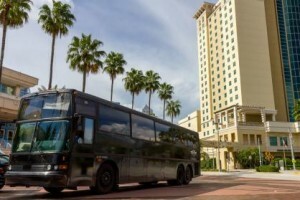 If you happen to be in Egypt Lake-Leto, Temple Terrace, Lake Magdalene, Mango, Brandon, Citrus Park, Bloomingdale, Oldsmar, Lutz, Safety Harbor, Pinellas Park, Saint Petersburg, East Lake, Dunedin, Largo, Ft Myers, or any other city in Florida, you can get your party bus Tampa Florida to come and pick you up.